The Government of Guyana said it is moving along with its plan to construct a new Demerara River Bridge and will soon commence the process of pre-qualifying contractors for the project. Construction on the long-awaited new Demerara River Bridge, to ease the pressure on the Harbour Bridge, is expected to begin next year, government says. Through the Ministry of Public Infrastructure, contractors will be pre-qualified for the finance, design, building, and maintenance components of the structure. These works will be procured through public tendering, with a restricted number of bidders. The procurement process, a government statement said, will be a two-phase one – the current pre-qualification phase and the bidding phase. In the pre-qualification phase, three contractors will be shortlisted and requested to submit designs and offer a fixed price lump sum bid for the design and construction of the bridge and approach roads. Furthermore, in order to improve the funding package, applicants for shortlisting are requested to advance proposals for financing the project. It was also disclosed yesterday that the Request for Pre-Qualification Document will be available for download on the Ministry’s website, www.mopi.gov.gy, from August 21, 2017. 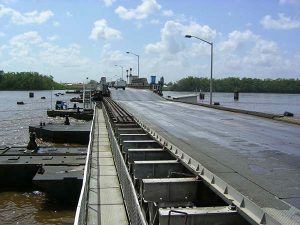 The proposed Demerara River Bridge is approximately two kilometres north of the existing floating bridge, spanning from Houston on the eastern bank of the Demerara River to Versailles on the western bank of the Demerara River. The project will see the construction of an approximately 1,500m long fixed bridge with a movable span and two approach roads of a total length of 600m. It is envisaged that the project will commence in 2018 and will be delivered in 2020. The current Demerara Harbour Bridge, almost four decades old, has been struggling to take off the daily traffic between West and East Demerara between La Grange and Peter’s Hall. It has been blamed for the traffic woes at peak hours between the East and West Banks of Demerara. The project is a priority one for the administration. New housing schemes on both sides of the Demerara River have seen an explosion of growth, putting further pressure on the existing bridge. The thousands of vehicles being imported and added to the roads annually have also not been helping the situation.